Unemployment rates in the majority of District counties were higher in 2013 compared with 2007, the year before the Great Recession (see map). Unemployment rates in several counties in the eastern and western parts of the district were more than one percentage point higher in 2013 compared with 2007. Meanwhile, most counties in western North Dakota benefiting from the energy boom posted decreases in unemployment rates. Overall performance can also be seen in Charts 1-6, which compare 2013 unemployment rates with rates in 2007. Dots above the 45-degree line indicate the unemployment rate in 2013 was higher than prior to the recession in 2007. Dots below the 45-degree line indicate that the unemployment rate in 2013 was lower than the rate in 2007. In each figure the respective state’s counties are highlighted in red. 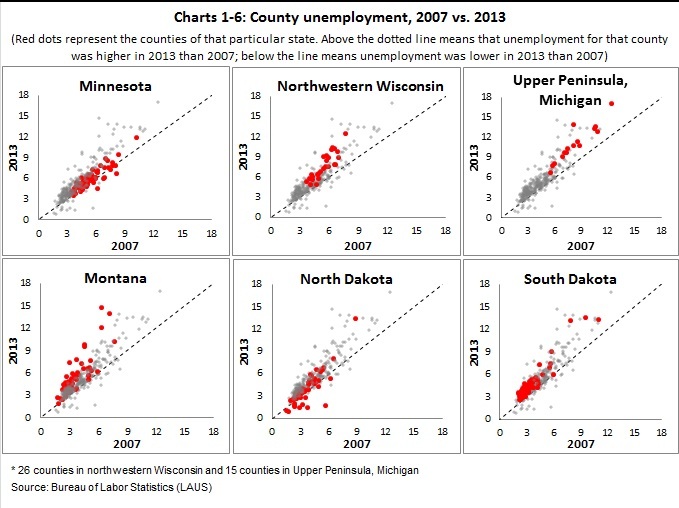 North Dakota has the largest share of counties with lower unemployment rates in 2013 than in 2007. Meanwhile, unemployment rates in Upper Peninsula of Michigan counties were all higher in 2013, and have been generally higher during this period than most other district counties.